These chicken wraps are the perfect take along food to a picnic as they're delicious hot or cold. Easy to make and easy to eat. I bet you can't eat just one. When hubby and I get into the kitchen to cook most times what comes out is pretty good. I made the wraps while hubby made his Mile High Nachos. I added guacamole to the wraps but you could easily make them without if you prefer. Cut up the chicken breasts either before cooking or after cooking. In a bowl toss the cooked chicken with 1/4 bottle of Chipotle sauce. 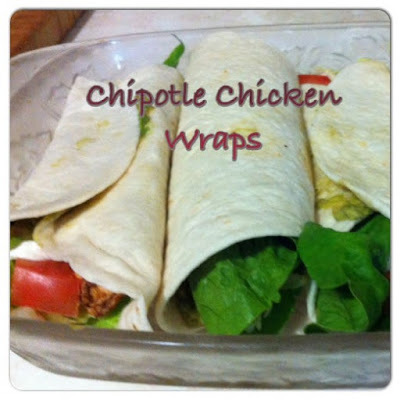 On each wrap place a lettuce leaf, chicken, chopped tomato, shredded cheese, guacamole and sour cream. Wrap up and set on a plate to be served. These chicken wraps sound delicious and certainly look easy enough to prepare after a long work day. Thank you so much for sharing this recipe. I can hardly wait to try them.